Sweet and smelling fruit? This might not by a good thing if you don't work outdoors. How you choose your diet can have a detrimental effect on your body odor and breath. Beware. Whether it is planning your meals, figuring out when to exercise, taking the right supplements, or using the right exercise equipment, there are many things that you need to take into consideration when dieting. However, the drawback to there being so ways to diet is that not all methods should be treated equally. There are products out there that despite how promising they are fail to produce results and can potentially cause your body. This is why even if you manage to lose weight, but end up harming health there may be something wrong with your diet. So that you don't make the same mistake of choosing the wrong diet, let's look at some bad diets and see how they negatively affect your health and be on our way to being able to make more informed choices regarding dieting. There are a lot of diets out there that make promises that are difficult to keep, such as being able to lose 10 pounds or drop you body fat by 10 percent in a week. Although at first glance they have your attention, after actually sitting down and thinking about it, you realize how unrealistic they really are. What makes matters worst is when you start doubting your own intuition, looking at the before and after photos of people who are said to have lost it all, thinking that you too could do the same. Even if it's true, there are many consequences that go along with extreme diets such as harm to your body. At first this is less apparent, when all you are looking to do is lose weight and slim down. This vulnerability causes you to jump into the danger zone, turning into a diet product addict. Not only is it potentially harmful to your body, the after effects leaving your body in a condition that makes it easy for you to put on weight afterwards, diet rebound. This is why it is important to do research before hand rather choosing your diet based on how easy it may sound. There are diets out there that tell you can eat as much as you want without getting fat. With the promise of losing weight fast, people are ready to do just about anything to see results. Diets that restrict your food intake to one source are an example. You may have heard of diets such as only eating apples, the apple diet, or even more extreme the hard-boiled-egg diet. However, this sort of dieting shouldn't be continued over long periods of time. 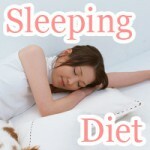 The truth to the matter is that these diets should only be done for short periods, such as 3 days. This is what is known as a fast. It is easy to get carried away misinterpreting fasting and cleansing diets as losing weight and keeping it off. Temporarily that may be the case, but in the long run, after returning to your usual diet, results may differ. After dieting this way for longer than the prescribed period, you may be impressed with the weight you lost. However, after returning to a normal diet, you put the pounds back on and possible a few extra. At this point it is easy to confuse weight gain with switching your diet, causing you to revert back eating only apples. 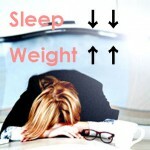 This not only makes you dependent on an extreme and demanding diet; it also takes a toll on your body in the long run. Avoid diets such as this, because they are only bound to rebound. The reason behind why diets requiring extreme fasting often rebound are the weight you lose is not all attributed to fat; but instead can be the result of losing muscle mass and lack of calcium. As you lose muscle mass it becomes hard to burn off fat, decreased metabolism. In addition, lack of calcium can increase the chance that you will develop osteoporosis. When your body senses a sudden drop in food intake, it interprets this as potential malnourishment. To avoid real malnourishment, it makes sure to store away (as fat) energy to avoid future occurrences drops in the amount you eat. This in turn, makes it harder to burn off fat and can cause your bones to weaken. The human body shouldn't be treated like a machine only requiring fuel to keep on going. It has build in functions to prepare for drought, which fad diets don't take into consideration. This is why diets promising immediate results have the opposite effect of putting you farther from your goal of diet success. There are many drugs out their said to help you diet. However, even though it may be possible to lose weight by only taking them, there is a chance that they can severely damage your health. There are many drugs that have been introduced into the market that have been banned from sale due to strong side effects. This is not only a problem you may face in your home country. The sale of drugs and dietary supplements has taken its markets online. In fact, the online market for drugs and dietary supplements is vaster than what you are use to seeing at department stores. This makes harder to differentiate between what is actually good for you and something that seems like a shortcut. In addition, the use of laxatives and diabetic in diets has become more common. Don't be fooled. Laxatives and diabetics shouldn't be used for the sole purpose of dieting. As you depend on these drugs, you body begins to rely on them to function. This could lead to losing control over your bowel movements. This is why if you have to use these drugs, only taking the amount prescribed is recommended. People taking these drugs without symptoms risk harming their body and becoming dependent on taking them. By not getting enough fluid intake or having unbalanced nutrition can cause this. Constipation not only is bad for the environment inside your intestines, it makes it harder for you to slim down and loose weight. Even amongst young people this is a problem occurring more often than you think, behind the scenes. As the constitution of your bones grows weaker, the risk that you will develop osteoporosis as you age becomes high. Whether it is binge eating or anorexia, there are an endless number of eating disorders that you have to avoid. Whatever you want to call it, eating disorders often lead to many complications both with your body as well as mental well-being. Upsetting your hormone balance can affect the way you menstruate. That is even though your period comes, ovulation doesn't occur. This could lead to difficulties when trying to conceive a child. 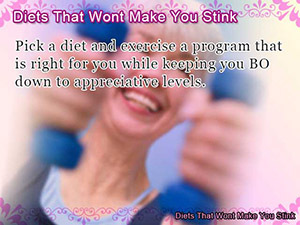 Choosing the wrong diet can cause you to stink!? If you've been told you have bad breath or offensive body odor, your diet may be the reason why! In fact, bodily order caused by your diet, diet odor, is not that uncommon. It is a common symptom of putting yourself through an impossible diet. You may be asking why this happens. Let's dive into the secret behind diet odor. The accumulation of diet odor happens in steps. At first, the symptoms are such that not only don't the people around you fail to notice, you do also. However, from this point on you begin to develop a sweetly sour smell in your breath as well as your body. The reason this happens is because of fatty-acids, uric acid, and kontone bodies. In choosing the wrong diet, it is easy to put your body in a situation that it lacks energy, pulling you metabolism down. When that happens, your body is unable to exhaustively burn off (fatty-acids) what it is used to and is trying out new ways to get energy. In the process your body ends up making more than what is needed, producing a sour and often times (surprisingly) explosive odor. There are many of use to focus, or even in the zone while dieting that we fail to notice what other might find offensive, BO. No body likes to be told they stink. Choosing the wrong diet can have a negative effect on your body odor and the smell of your breath. So, if you are worried about whether you choose the right diet or not, trust your nose. If you smell, then you might want to consider a new diet or change the one you are currently in. Shoot for a diet that is easy on your body as well as on others. Finding out the diet and exercise program you are on is a fad really stinks? If you have BO then it must be. 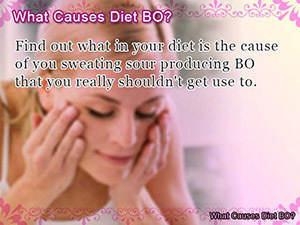 Find out what in your diet is the cause of you sweating sour producing BO that you really shouldn't get use to. Pick a diet and exercise a program that is right for you while keeping you BO down to appreciative levels.